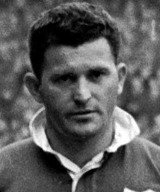 Jean Prat won 51 caps for France in a career spanning a decade between 1945 and 1955, scoring nine tries. He won the Légion d'honneur in 1959 and coached France between 1964 and 1968. He died in 2005. Born in Lourdes, he won his first cap against the British Army in January 1945 and became captain in 1954. Arguably his finest hour came a month later when he scored a barnstorming try that sealed a 3-0 victory over New Zealand in Paris. He also led his country to their first ever Five Nations Championship title in 1954 when they shared the glory with England and Wales.